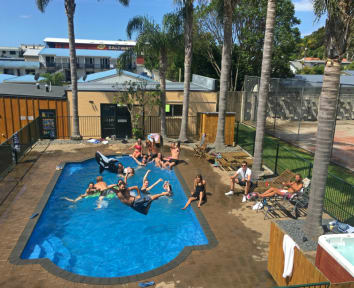 We are more than just a hostel - with our extensive range of facilities we are a true backpackers resort. We offer a range of accommodation options including dorms, private rooms, fully self-contained studio rooms and apartments. 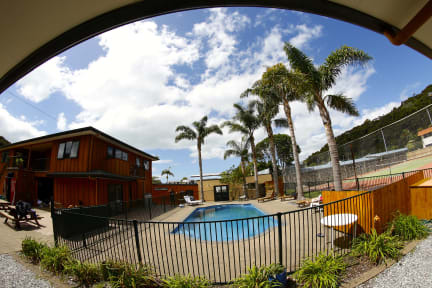 The Bay Adventurer provides great value accommodation for backpackers, independent travelers, couples, small and large groups. Facilities include - free unlimited WiFi, swimming pool and hot spa, tennis courts, BBQ area, outside dining in our communal courtyard, kitchens, laundry, lounge with TV/movies, off-street parking all in welcoming social environment! We also have a discount booking service on local excursions and our friendly, knowledgeable staff can advise and book all of your tours and activities for you. We welcome groups and sports teams but advise you to contact us before booking. Please note we do not accept stag parties. All bookings must be confirmed with a credit card number, valid at the time of the reservation. No shows will be charged the full amount booked. If your likely to arrive after hours please advise us in advance. Absolutely loved it here, perfects location, amazing staff, would definitely stay again. Although it’s bit of a party hostel, it’s only super loud on the weekends, and it never goes on too late as there are loads of bars nearby that people would rather go to after 10:30 or so. good hostel, friendly staff, clean rooms. Cheap price with a lot of facilities. Only issue was with the wifi as they had an outage - seems to be common in NZ! We really enjoyed our stay at this hostel. The staff was very nice and the woman at the front desk was extremely nice and helpful and recommended some really fun activities tailored to our interests and they ended up being great. They have a nice hot tub which is a plus and there were a bunch of people out at night socializing. Comfy beds and very clean. If you chose not to stay here because it's a party hostel- don't worry It's not! Average hostel, would probably try somewhere new next time. There are plenty of other hostels on the same roads, choose one of them instead. My bed hasn’t even been changed when I checked in! Bathrooms weren’t clean at all. A pretty disappointing stay here.